The history of North Korea as in the Democratic People's Republic of Korea (DPRK) starts shortly after the liberation of Korea from Japan. According to official accounts, a young Kim Il Sung set off with his family to China in 1925 to help liberate Korea from Japan. Anti Japanese forces developed in China. These were formed by Chinese, Koreans and later Soviets. Korean guerrilla forces were formed in Northeast China. The now Eternal President Kim Il Sung formed the Korean People's Revolutionary Army (KPRA), which in 1937 took over Ponchobo, now considered a great victory in North Korea. Korean guerrilla would move around the Chinese-Korean frontier. 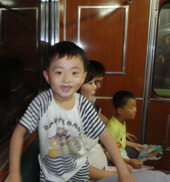 According to DPRK facts Leader Kim Il Sung and his soldiers were based in Mt. Paekdu where the future General Kim Jong Il was officially born. 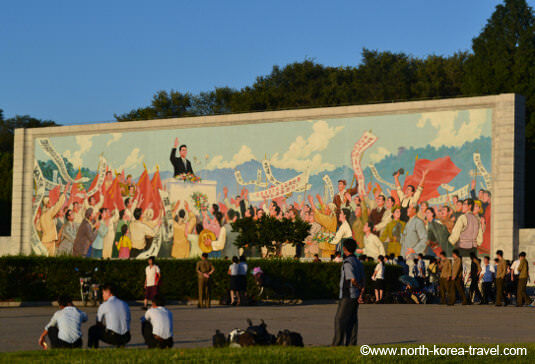 The mural above shows Leader Kim Il Sung's speech upon arriving back to Korea in 1945. 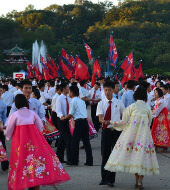 Mass Dances usually take here on national holidays in DPRK. Once Japan surrendered the Korean peninsula was divided into two zones at the 38th parallel. The Northern part was under supervision of the Soviet Union and under the guidance of Leader Kim Il Sung, whereas the southern part was under US control. By 1948 two different governments are formed, the North being the Democratic People's Republic of Korea (DPR Korea, formed on September 9th 1948) and the South being the Republic of Korea. A few months later that year the USSR completely withdrew its troops from North Korea. It soon became apparent that the two Koreas, with completely different political ideologies, would struggle to reunite easily. Please click on our Koryo (the origin of the word "Korea") link to read about this strong unified Kingdom or here to go from our History of North Korea - Liberation from Japan to read about other periods of Korean history.